Annual holiday get-togethers always feature a grand cast of characters. This year the wise-cracking drunk, the overly sensitive cook, the gushing sentimentalist, the determined wanderer, the eager helper, the laissez faire parent and the bad conversationalist all made an appearance. Alas, I am still in the process of discovering myself. Fortunately, however, my relatives patiently endure these grating personas of mine. At least to my face. Foods can take on different personalities too, depending on the company they keep. Remember how, in the early days of this blog, the carrots in the Carrot and Fennel soup took on a wonderful squash-like flavor. We’ve also seen pork influenced by the savory taste of sage as well as the spicy heat of a Mexican-style asada and the sweet heat of a Middle Eastern tagine. Sometimes these taste combinations bring out unfamiliar aspects of the various ingredients. Other times they just hide their true nature. It brings to mind the movie Zelig, a Woody Allen film from my college days. In this story, the title character took on the physical and social characteristics of whomever he came into contact with. Like a human chameleon. But having an adaptive personality was deemed a bad thing, so the doctors set about to change Zelig and put him through extensive therapy sessions to help him determine who he really was. All of us are expected to go through this sort of self discovery at one time or another. Some of us Californians never stop going through it. Not to worry, though, this blog is still about soups, not navel-gazing. Note: For those interested in navels, this is the best time of year to do it. If there’s one season I’ve always been aware of in California, it’s navel orange season. During December and January seedless oranges are almost always perfect. Eat up. This week’s recipe started out as a coupling of sweet and tart—butternut squash and Granny Smith apples. 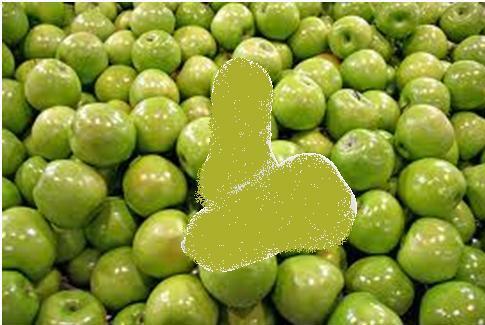 Admittedly, Granny Smiths are wincingly sour, but at least you know where you stand and never wind up with a mealy fruit. My thought was that the rich sweetness of the squash would combine well with the apples. Unfortunately, because I used so many apples (Who knew four would be too much?) the squash took on an apply character and the soup devolved into something resembling applesauce. A fact exaggerated by the addition of cinnamon. So there we were, near the end of the cooking process, with applesauce soup. My first fix involved adding the chili powder I’d seen at corner fruit stands in Los Angeles, but I got nervous about making the soup too hot and chickened out after two half teaspoons. Then I went for a different kind of sour—dairy. The addition of goat cheese brought back the balance between the sweet-tart applesauce flavor and the more savory sour of milk. It could have actually stood twice as much goat cheese but I only had the three tablespoons. I’d recommend at least that much, but feel free to experiment to find the soup that works best for you. Cooking, like all interesting parts of life, is a process of discovery. If you discover something about yourself, that’s not such a bad thing. If not, don’t feel bad. I know I’m still looking. Split the squash lengthwise, then place the halves face down on a sheet pan and cook in a 350°F oven for 45 minutes to an hour, removing them when the flesh is soft to the touch. After the squash cools, remove and discard the seeds, then scrape out the softened flesh and place it in a 3 quart soup pot. Add the apples and stock to the pot, bring the soup to a boil, then reduce the mixture to a simmer for 30-40 minutes. Puree the soup to a smooth consistency with an immersion blender then add the milk, seasoning, cinnamon and chili powder. Finish the soup with as much goat cheese as you see fit and serve with crusty bread and butter. Image Credit: “Find the Squash,” a particularly shoddy MS Painted metaphor. Is anyone ready for a new year? Look forward to a new incarnation of the Soup Blog on its first anniversary. In the meantime, leave a comment about the current state of things. I’ll be reading and responding. My butternut is already chopped and ready to go. Should I just roast it till it’s soft and then carry on? Sorry for the very, very, very late response, but yes. Cut it in half. Put flat side down on a cookie sheet and bake or roast until soft. Then scoop the flesh out and go on with the soup making.